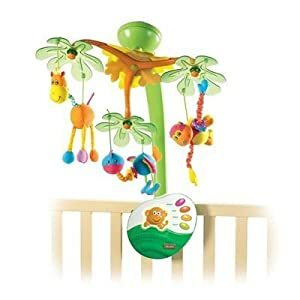 We bought this mobile (music with moving stuff animals) from Amazon (recommended by ToddlerRecipe). But she seems like the black and white pictures her mom printed off the web better. She seems don’t care too much about the music and the stuff animals. It’s interesting the free stuff works better than the $36 toy. I guess love is more important: her mom put a lot effort searching and print the black white pattern pictures. From scientific point of view, the baby of her age is more sensitive to black/white than the colorful stuff animals. The soothing music does calm her down.